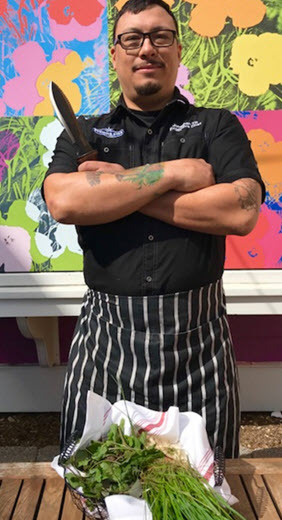 Last October Jonathan Till arrived at Del Ray’s Evening Star to take over as Executive Chef in a restaurant that has been successful serving a mostly local clientele for over two decades and seen its share of chefs. It’s also seen its ups and downs. Till brought with him a wealth of experience from his education at the New England Culinary Institute and an internship at L’Espalier in Boston, where he trained under James Beard Award winning chef, Frank McClelland. From there he received an Associates’ Degree in Culinary Arts in 2008 and learned pastry under Certified Master Pastry Chef, Frank Vollkommer, at the Saratoga National Golf Course. Locally, Till spent two years at William Jeffery’s Tavern, a neighborhood joint featuring pub food, followed by two years as a corporate chef for the Barteca Restaurant Group before they were bought out by Del Frisco’s for a cool $325M. Before all that, he’d taken a turn or two in fine dining (two months spent picking shells out of crabmeat in a dark room at The Dabney was not to his liking) and farm-to-table. As it turns out, connecting with farmers and growers seemed to suit him far better. At the casual Beekman Street Bistro in Saratoga Springs, New York’s tony arts district he’d enjoyed relationships with local Mennonite farmers, and at the five-star Hermitage Hotel in Nashville he was able to source many of his ingredients from their historic vegetable gardens and private cattle farm. Till’s curiosity peaked when right out of culinary school he met an old trapper and farmer who taught him how to forage in the wild. He’d come from generations of home canners and wanted to preserve the bounty he culled from the fields and forests. After that auspicious meeting, he began making his own charcuterie and experimenting with wildcrafting and homesteading techniques including learning the pleasures of tapping maple syrup. When I spoke to Till this March, he had just returned from ice fishing in Canada. 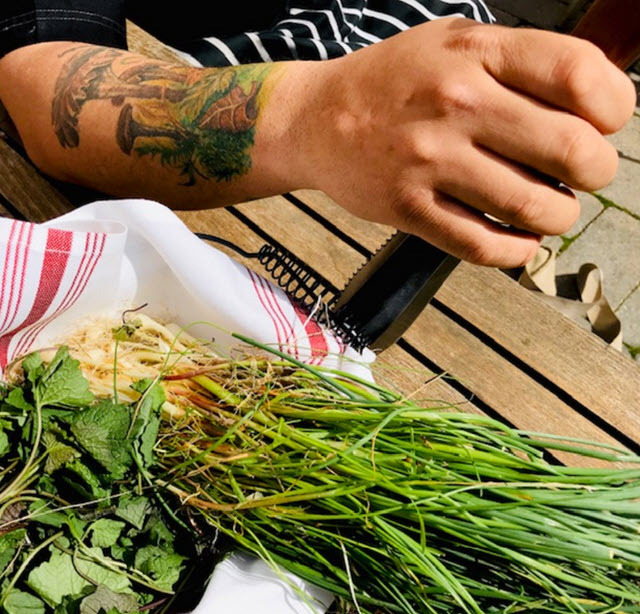 This week he’ll present Evening Star’s new Spring menu incorporating wild-foraged stinging nettles, garlic mustard greens, and spring garlic. Ramps will appear on the menu in a few weeks. All in due time. 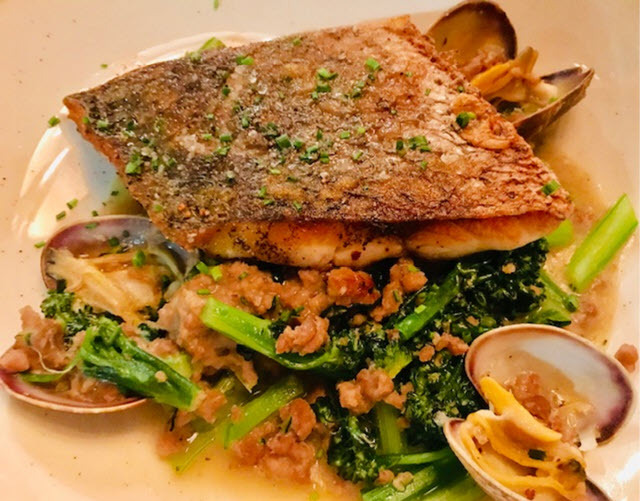 Having seen the Spring menu there are a lot of dishes I’m looking forward to – duck with Virginia buckwheat honey, foraged greens, glazed black soybeans and wild garlic and an inspired dish of American snapper with fava beans, asparagus, morels and uszka dumplings. A planned dessert, Strawberry and Rhubarb Galette with lightly churned cream, sounds positively irresistible. Who inspired your interest in cooking? My grandmother was my mentor. She is a third-generation chef in the family who had four or five restaurants. Other family members worked in restaurants too – uncles and aunts – and my mom was a café owner at one time, so my path was pretty much set for me. Will you be involved in the local farming community? I’ve been working with Pam Hess the Executive Director at Arcadia [Arcadia Center for Sustainable Food & Agriculture] where I’m learning about what’s grown in Virginia. Next year we will set out a foraging walk to tie into permaculture. I’m very passionate about teaching and educating people and hope to make an impact. What’s different about the food at Evening Star [ES] since you’ve been there? Neighborhood Restaurant Group as a whole is going through an overhaul and there are big changes at their other restaurants, like Vermillion and Hazel. The company reviewed their image and went out to pick some of the best chefs they could find. How I cook for Evening Star is how I eat home. I want warm, comforting dishes and some lighter things too. When I was approached by ES I was out picking mushrooms. I had just returned from a trip to Europe where I was eating my way around the Continent with my wife and foraging for mushrooms in the Czech Republic. Foraging is a huge part of what I do. I go into the woods and get it for free. This summer I established relationships with local farmers and developed a good connection with them. Since I am new to the area, I had to find spots to go foraging. ES has a rooftop garden, but it only has six inches of soil. We have to get the soil up there using ropes and a bucket. It’s very intense. This winter I set up some grow lights in the basement and started growing microgreens when a supplier wanted to charge me $100 a flat! I’m using heirloom seeds from Monticello [Thomas Jefferson’s Monticello in Charlottesville is a World Heritage Site] where they have a program called the Thomas Jefferson Center for Historic Plants. They will be using 800 acres of their property just for heirloom crops. What ingredients have you foraged recently? I found spring garlic while foraging last week and caught lake trout while ice fishing in Canada. Are you cautious not to overharvest? I only harvest one third of what I find. I learned my lesson years ago when I picked all the chanterelles from one patch and it took five years for them to come back! What’s the most popular dish you can’t take off the menu? Acorn pasta made with flour from acorns I foraged, has been really popular. Unfortunately, I’m out of the acorns for now. Also, guests seem to not get enough of chicory – brined and seared with black pepper and served with a side of kombucha squash and sage. The pork chop schnitzel and gumbo are favorites now too, and the sea bass served with clams and broccolini. I had the sea bass the other night and it was perfectly prepared with a crisped skin and tender flesh. It’s important to understand what goes into raising or catching food. I have raised animals and farmed before and it bothers me when people don’t respect the protein. What do you see as the future of Evening Star? I’m still getting used to the flow. Seeing how the summer is going to be when we open the patio. The balance is going to be interesting. I plan to be at the farm and continue foraging this summer. Next year I’ll know exactly what to expect. 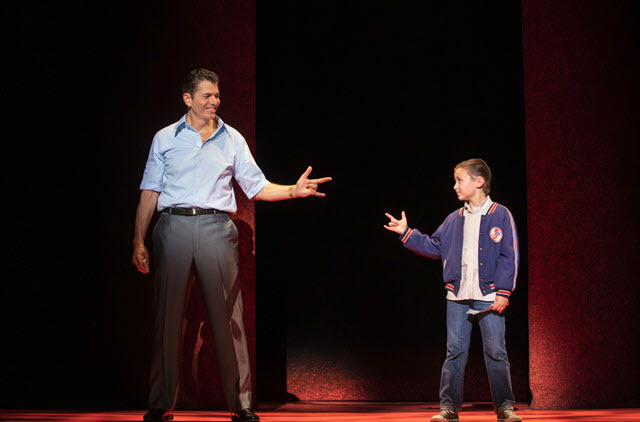 With actor/playwright Chazz Palminteri there to cheer on his cast, A Bronx Tale kicked off its one-week run at The National Theatre. It was a ready audience filled with those who know and love this show and they were ready for the laughs and the tunes. As Palminteri reminded everyone about his autobiographical story, it’s all about not wasting talent, advice his father, a Bronx bus driver, imparted to him from the time he was a nine-year old kid on the mean streets – streets that were divided by the blacks on Webster Avenue who guarded their turf with fists and Molotov cocktails and Italian mobsters who ruled Belmont Avenue with guns and bats – guys like Tony 10 to 12, Frankie Coffeecake, Eddie Mush and Jojo the Whale. Between the gunshots and street fights, bar fights and insults, are the musical numbers. 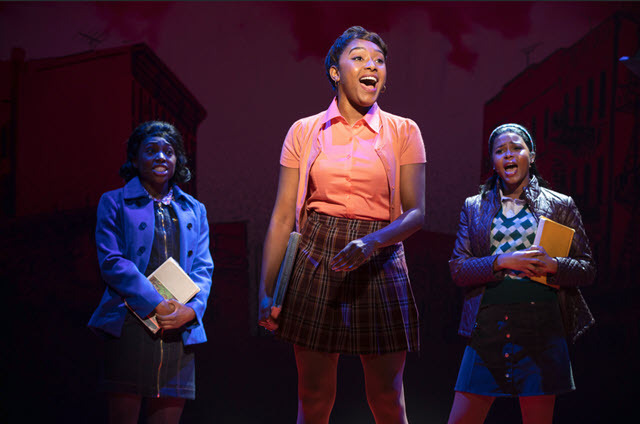 It’s a set piece from the 60’s filled with the doo-wop croonings from the impromptu jukebox jockeys and the sweet sha-na-nas from the neighborhood black girls singing early Motown. The musical has a primetime pedigree. Directed by two-time Oscar winner Robert De Niro and four-time Tony Award winner, Jerry Zaks, the snappy tunes are composed by Oscar, Grammy and Tony Award-winning composer Alan Menken. If you like mobsters, hitmen and their nefarious gangs and how they drew a kid into their criminal lair, this one is for you – the fights, the crap games and the fear that Sonny, the crime boss, imparts to his crew of ignorant thugs. A ‘rat’ is the worst kind of enemy when you live under the code of Omerta, and Calogero, the boy, chooses not to rat on Sonny when he sees him shoot a man in cold blood. Sonny is appreciative of the boy’s silence and takes him under his wing. He tells him to choose Love or Fear as a way of life. Calogero’s parents are appalled. The story touches on the racism that existed in the Italian neighborhoods and, warning: crude slang is used to describe African Americans, especially when Calogero grows up and falls for Jane, a lovely black girl who sees a better future for him. After all the deaths and all the murders, Sonny turns into a kindly paternal figure to the teenage Calogero who goes straight. 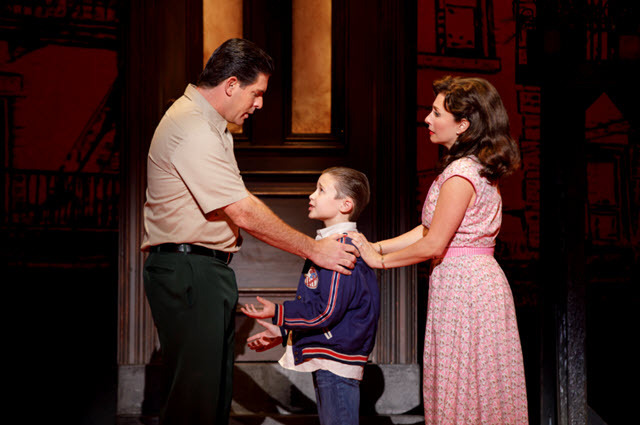 With Joey Calveri as Sonny; Shane Pry or Frankie Leoni as Young Calogero; Giovanni DiGabriele as Calogero; Richard H. Blake as Lorenzo; Michelle Aravena as Rosina; Brianna-Marie Bell as Jane; Antonio Beverly as Tyrone; John Gardiner as Rudy the Voice; Mike Bakes as Eddie Mush; Michael Barra as Jojo the Whale; Robert Pieranunzi as Frankie Coffeecake; Paul Salvatoriello as Tony 10 to 12; Sean Bell as Sally Slick; Giovanni DiGabriele as Handsome Nick; Alex Dorf as Crazy Mario; Jason Williams as Jesse; Brandi Porter as Frieda; and Peter Gregus as Carmine/Police Officer/Gang Leader. Scenic Design by Beowulf Boritt; Costume Design by William Ivey Long; Lighting Design by Howell Binley; Sound Design by Gareth Owen; Choreography by Sergio Trujillo. A ten-piece orchestra is led by Brian P. Kennedy. Through March 31st at The National Theatre, 1321 Pennsylvania Avenue, NW, Washington, DC 20004. For tickets and information visit www.TheNationalDC.org or call 202 628-6161. 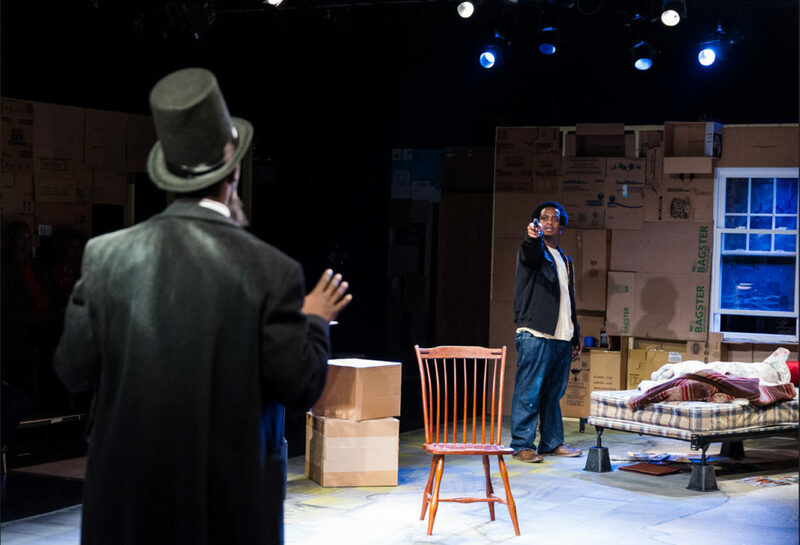 Playwright Suzan-Lori Parks’ Top Dog/Underdog is a tale as old as Cain and Abel. Two brothers, abandoned as children by their parents, find cold comfort in fraternal discord. The mean streets of New York City provide the setting. Their names provide a clue to the irony that defines their lives. Booth and Lincoln. Lincoln, the elder, works in a rinky-dink arcade where, in top hat and frock coat as the former president, his days are filled with a crush of tourists who fake-assassinate him for a small fee. He is black, so there’s that ironic twist, though he’s grateful for the steady employment after living the fraught life of a hustler grifting tourists with the shady confidence game of Three-card Monte. The problem is Lincoln was good at it. Very good. And his dissolute brother wants him as a partner in the easy money game while also teaching him the tricks of the trade. “Schemin’ and dreamin’,” Booth calls it. For a time, they reminisce about the old days when they were flush from hustling or stealing and the streets were filled with “marks” out on the town with a pocketful of cash. But Lincoln’s refusal to return to a life of crime causes constant friction between the two men, and Booth threatens to throw him out if he won’t buddy up. The men are constantly scamming each other like the hustlers, lookouts, shills and ‘sticks’ from Lincoln’s old gang. Their lives are base, their language baser, yet their bickering and challenging one another make for some of the most viscerally powerful theater. 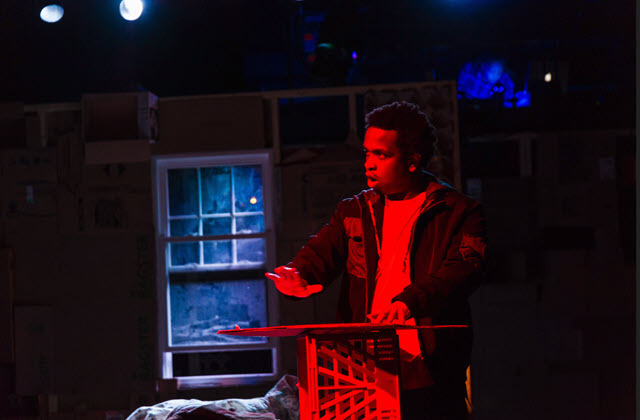 Set Designer Nephelle Andonyadis gives us the perfect witness box to view the intensity. Rows of seats are situated on two sides of a long stage mimicking the railroad flats so popular in early city buildings. Walls are papered with cardboard and egg cartons creating an environment that the audience experiences immediately upon entering. The acting is astonishing. 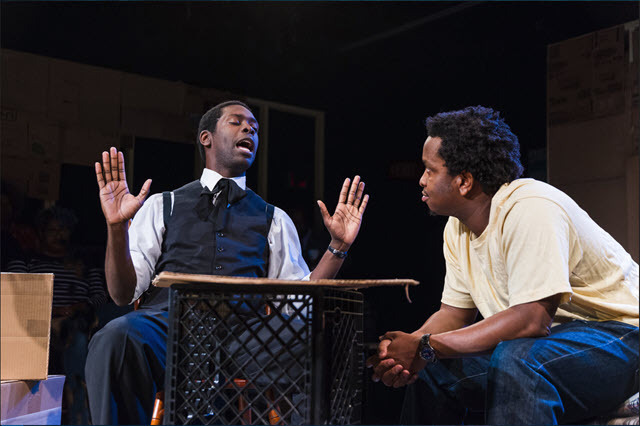 Both Louis E. Davis (Booth) and Jeremy Keith Hunter (Lincoln), who reminds this reviewer of a young Sidney Poitier, turn out some of the most tremendous performances I have ever seen in a two-hander. As a side note, Hunter got the role one week before opening night, when the cast member dropped out. We just saw him in MetroStage’s The Painted Rocks at Revolver Creek. In the more than capable hands of Director DeMone Seraphin this provocative drama stuns at every turn. Gripping, exhilarating and brilliantly acted, it will leave you breathless. Highly recommended. Krysta Hibbard, Associate Director; Costumes by Danielle Harrow; Lighting and Projections by John D. Alexander; Composer and Sound Design by e’Marcus Harper-Short; and Fight Director Casey Kaleba. Performance schedule – Thursday, Friday and Saturday at 7:30pm and Saturday and Sunday at 2pm matinee – through April 14th at Gunston Arts Center, 2700 South Lang Street, Arlington, VA 22206. For tickets and information visit www.AvantBard.org/tickets or call 703 418.4808. In the vein of Hamilton along comes JQA. It is not a musical, though there is occasional contemporary music with a back beat that lightens the pace, but it is an historical piece based on the life of John Quincy Adams. Its playwright and director, Aaron Posner, writes that it is “not to be taken as accurate in any way”, though Adam’s achievements and rise to power, as well as his astonishing career in American politics are well known. Think of it as a fictionalized version of the room(s) where it happened. (l-R) Eric Hissom and Joshua David Robinson ~ Photo credit C. Stanley Photography. (L-r) Joshua David Robinson, Jacqueline Correa, Phyllis Kay and Eric Hissom ~ Photo credit C. Stanley Photography. 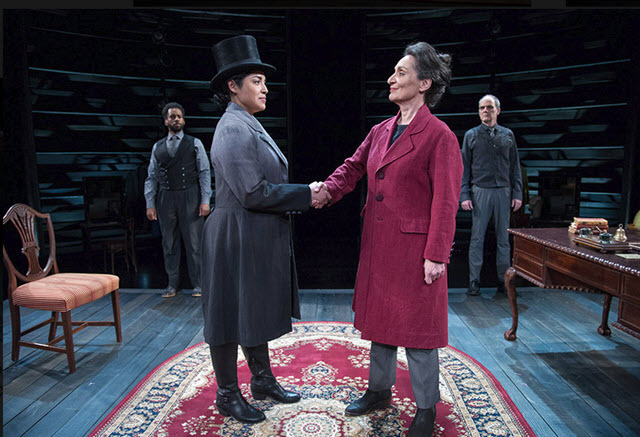 The play opens with a scene between John Adams, his illustrious father and second American President asking the child, “What is government?” When young John cannot answer such a broad question, Adams, Sr. tells him that it’s about self-management. “Individuals require government. Civilizations need laws and codes to keep us safe.” Thus, begins the boy’s political education. (l-r) Phyllis Kay and Eric Hissom ~ Photo credit C. Stanley Photography. Through vignettes, we follow Adams’ fraught marriage in 1797 to Louisa, a foreigner, and his early diplomatic career as Minister to the Netherlands and Prussia, followed by his election as Massachusetts State Senator, Minister to Russia and the UK, Secretary of State under Monroe, nine terms as Congressman, up till his single term as the 6th POTUS. Chunks of his life are highlighted in different settings in Massachusetts and Washington, DC, where his philosophies are explored and challenged according to his history in government legislation and his relations with his family and political peers. The script is written in modern-day vernacular and the parallels to our country’s current polarization are stunning, such as when Clay advises him, “Give the people something to fear. Then you can take away their liberties.” Adams’ answer, “I will provide hope.” We are still fighting this battle of fearmongering as a tactic to control the citizenry as opposed to governing by hope and inspiration. JQA is part of Arena Stage’s “Power Plays” initiative. 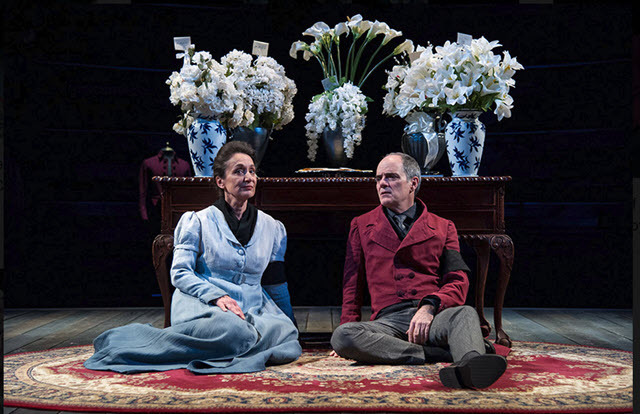 (l – R) Joshua David Robinson and Phyllis Kay ~ Photo credit C. Stanley Photography. The staging is brilliant. 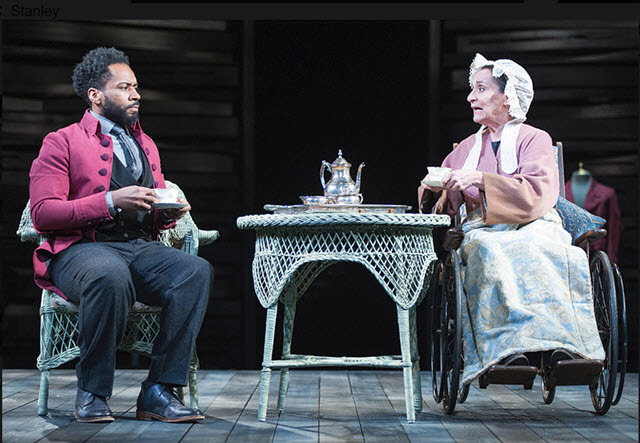 Characters weave in and out of Adams’ fascinating life portrayed by two male and two female actors who assume all the roles with each actor taking a turn as JQA. 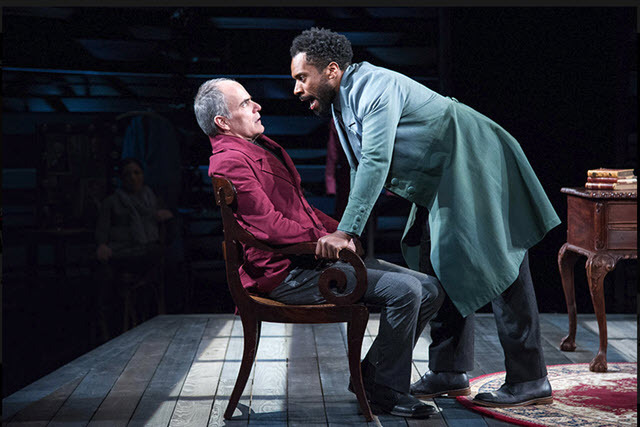 I particularly enjoyed Posner’s clever choice of casting African American actor Joshua David Robinson to portray both Frederick Douglas and Andrew Jackson. Touché! With Jacqueline Correa as JQA/Louisa Adams/Abraham Lincoln; Eric Hissom as JQA/John Adams/Henry Clay; Phyllis Kay as JQA/George Washington/Abigail Adams/Louisa Adams and Joshua David Robinson as JQA/Andrew Jackson/Frederick Douglass. Set Design by Meghan Raham; Costume Design by Helen Huang; Lighting Design by Jesse Belsky and Sound Design by Karin Graybash. Jocelyn Clarke, Dramaturg. Through April 14th at Arena Stage – 1101 Sixth St., SE, Washington, DC 20024. For tickets and information call 202 488-3300 or visit www.ArenaStage.org. Under the direction of Garnett Bruce, Faust becomes idyllically condensed. You didn’t really expect the 21-hour, five-act version, did you? This one is three and a half hours with two 20-minute intermissions between acts. Premiering in 1859, Charles Gounod’s opera debuted in the Théâtre Lyrique in Paris. It derives from Goethe’s story of the man who sold his soul to the devil in exchange for the supernatural powers that would give him love and youth. As for Méphistophèlés, he was all too thrilled to grant him the ultimate wish on the condition he serve him in Hell. Unbeknownst to our soul-seller, Satan is determined to make it a two-fer. First, he lures in Faust, then he takes his beloved Marguerite in the bargain. It was an easy plan as Marguerite’s brother, Valentin, goes off to war, and can no longer protect her virtue. Audiences loved it. It dovetailed neatly into their fondness for Byron and Shakespeare and was the just right fit for the ‘boulevard’ theaters of the 19th century Romantic period. Though these moralistic productions were considered ‘low-brow’ recreation, the excitement of witnessing stage magic, then called, ‘phantasmagoria’, was as addictive as the schadenfreude of seeing a fallen woman get her comeuppance. Mephistopheles (bass Raymond Aceto) predicts Marthe’s (mezzo-soprano Deborah Nansteel) future. Photo credit Scott Suchman. Gounod’s opera blends inspired elements of comedy, tragedy, and passion with a hefty dose of evil incarnate. 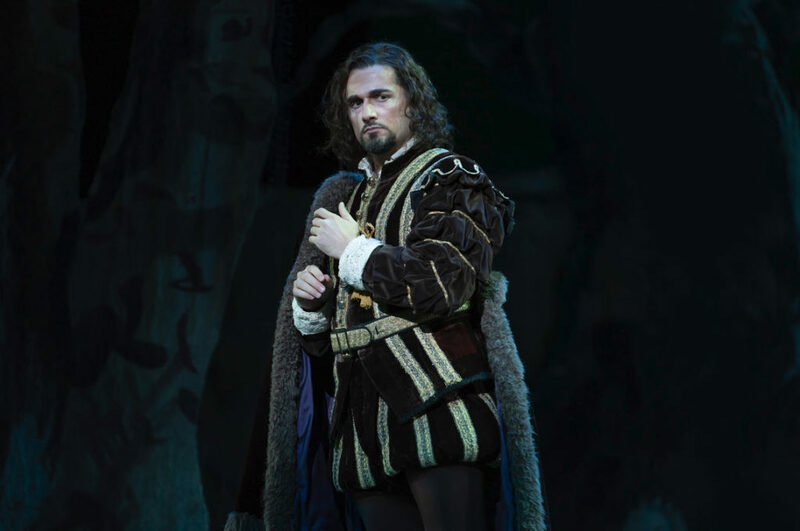 Comedy first arrives when, as the despondent Faust is about to end his loveless life with a chalice of poison, Satan appears in a fitted doublet and feathered hat looking like Sir Walter Raleigh and says to Faust, “Is my attire not to your taste?”. Doctor Faust, dressed in a manner befitting Copernicus, doubts his powers given his natty attire. Not the sort of challenge one should present to the Devil himself. Ah, well, Faust accepts the terms and the deal is on. The devil (Raymond Aceto) looks on as Faust (Marcelo Puente) woos Marguerite (Erin Wall). Photo credit Scott Suchman. There are many exceptional arias – the one between Faust and Marguerite is legendary. It’s the moment when she decides he really, really loves her by plucking the petals off a flower – as in ‘He loves me. He loves me not.’ That’s conveniently after she discovers the casket of lavish jewels he has gifted to her. After Satan’s urging to be more manly in his love-making, ‘Avant de quitter ces lieux’ marks the moment when she accepts his love. Here is where she loses her moral compass. Diamonds can do that to a girl. 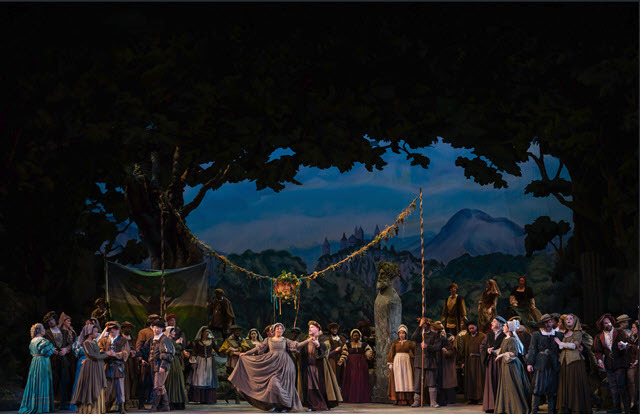 You could be blindfolded and skip the projected English surtitles, and still hear how Goudnod’s music reflects the disparate emotions throughout the libretto. Gounod was a pioneer in these reminiscence motifs and later composers borrowed his techniques. Earl Staley’s gorgeous scenic design and costumes are storybook perfect. From Faust’s study bathed in red to the villagers celebrating harvest time at a fair with a vignette of Adam and Eve, a juggling Pulchinello, giant masks on stakes, and acrobats tumbling across the stage cheer on the soldiers as they go off to war. Later an evocative garden scene beside Marguerite’s Tudor cottage windows becomes golden-lit by the glowing hearth as the season changes and snow falls. In the end when Marguerite faces her Maker to beg for forgiveness for her wanton and murderous ways, the stage becomes a massive church, Chartres-blue and featuring a massive cross. If that wouldn’t put the fear of God in audiences back in the day, what else would? Utterly magical and highly recommended. 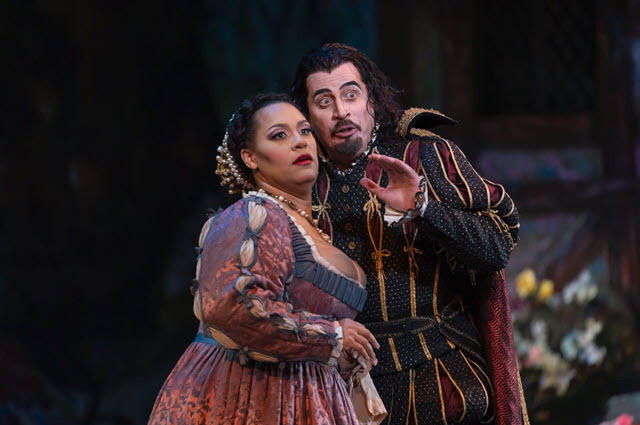 Featuring Marcelo Puente as Faust; Erin Wall as Marguerite; Raymond Aceto as Méphistophèlés; Samson McCrady as Wagner; Joshua Hopkins as Valentin; Allegra De Vita as Siébel and Deborah Nansteel as Dame Marthe. With The Washington National Opera Chorus and Supernumeraries. Libretto by Jules Barbier and Michel Carré. The Washington National Opera Orchestra conducted by Keri-Lynn Wilson; and Lighting Design by Michael Clark. Performances are on March 22nd, 24th matinee, 27th and 30th 2019. 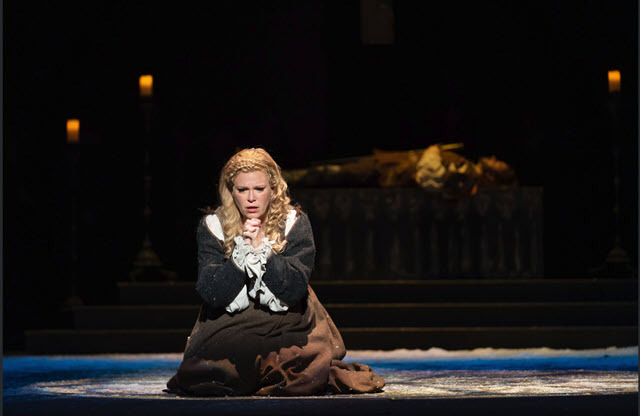 WNO presents a free pre-performance education event prior to every performance of Faust. These events begin one hour prior to curtain in the Opera House and last approximately 20–25 minutes. Musicologist Saul Lilienstein’s Opera Insights on Monday, March 18, begins at 5:45 p.m. and lasts approximately 35-40 minutes. Enjoy a free preview of musical highlights from two of opera’s grandest works: Tchaikovsky’s Eugene Onegin and Gounod’s Faust, running concurrently this March. 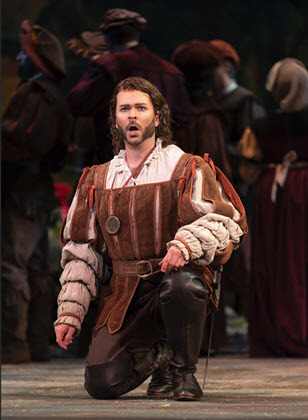 This special program features the vocal talents of WNO’s Domingo-Cafritz Young Artist Program performing each opera’s most famous works. Explore the Arts. Audience members get a behind-the-scenes glimpse of a world-class opera production through this unique open rehearsal experience. 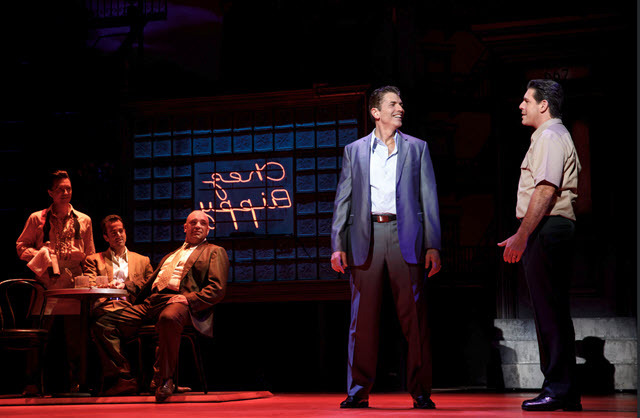 Using audio headsets, attendees can learn more about the production via expert commentary while watching a rehearsal with piano and the professional cast. Visit the WNO website for ticket information. Following the performances on Monday, March 18 and Sunday, March 24 in the Kennedy Center Opera House, please join WNO artistic staff for a wide-ranging discussion with the artists for an inside scoop on the production. These events are free to patrons presenting a Faust ticket and begin immediately after the performance. 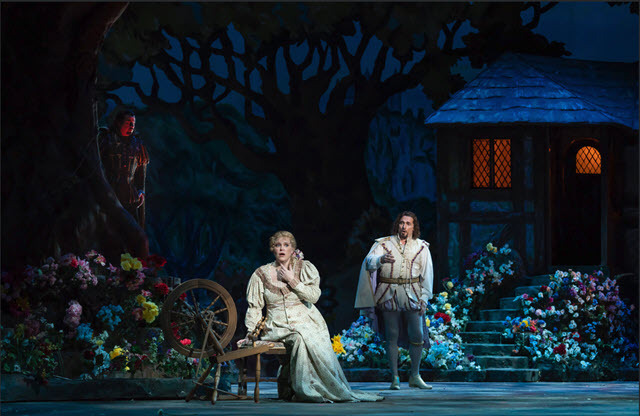 WNO’s Touch Cart will be open one hour prior to the performances on Friday, March 22 and Wednesday, March 27 to experience first-hand real props and costume items featured in the opera. WNO’s Education Department invites patrons to come early to touch and explore items from the production.